As the new fiscal year started for the Chicago Public Schools, Rahm Emanuel and interim-CEO Jesse Ruiz announced $200 million in cuts, including 1400 layoffs, while warning that even more devastating cuts to the classrooms will be coming down the line if the state fails to act on his legislative agenda – a legislative agenda that included no new progressive revenue sources. The mayor claimed that CPS has made hundreds of millions in central office cuts that have spared the classroom, and decried the state for holding CPS hostage to the state-level fiscal impasse. Both narratives are false. The mayor and his hand-picked unelected school board are in large part to blame for passing gimmick budgets and failing to pursue sound progressive revenue options for four years, and instead prioritizing their privatization and corporate reform agenda. Furthermore, the claim that CPS has kept cuts away from the classrooms is untrue. Immediately after the mayor’s press conference, the Chicago Teachers Union released a budget briefing that highlighted CPS’ false claims about central office cuts, the misplaced priorities of the administration, reckless outsourcing approved by the Board, dangerous indebtedness to banks, and ways by which CPS should prioritize their budget to meet the needs of students. 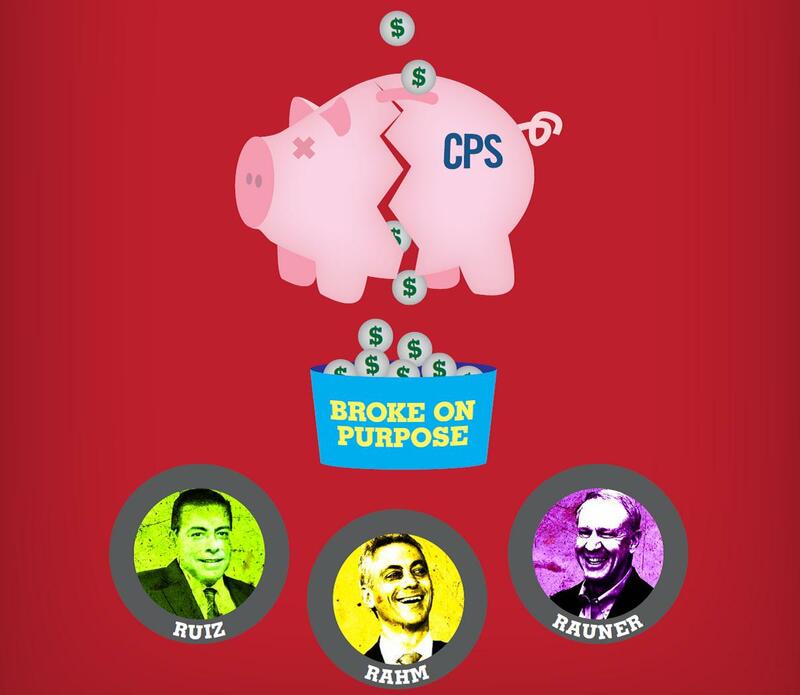 Despite claiming over $900 million in aggregate cuts ‘away’ from schools over 4 years, CPS has actually increased spending on central office salaries since 2011, by $22 million. CPS has not only held the line against budget cuts to its central offices involved in standardized-testing (Department of Assessment), expanding school choice (Innovation and Incubation) and test-based management of schools (Accountability), but they’ve increased spending on staff by 11% since 2011. The district spends nearly $300 million a year on interest on debt owed to the banks, and pays millions a year in fees to banks just to be able to sell more debt to the bond market. CPS is broke on purpose. Through their refusal to get progressive revenue, the mayor and his peers from the financial sector have trapped the city and CPS in a cycle of broken budgets and a dependence on financial instruments that exploit Chicago residents to enrich the corporate class. broke on purpose, budget. Bookmark.